If you're looking for a way to save costs on entertaining without giving up any of the fun, you don't need to look any farther than your own back yard. If you've got an outdoor barbeque grill—charcoal, gas, or wood—you've got everything you need to put together a wonderful gathering, whether it's just for a few family members and friends, or for everybody from your office. An outdoor charcoal barbeque grill can be as inexpensive or tricked-out as your cooking skills and budget dictate, and there's nothing that says "good times" like the great taste of food prepared on an outdoor barbeque grill. That savory charcoal or smoked-wood flavor just can't be beat! If you don't have a lot to spend, and especially if you live in a small space like a condo or an apartment, a simple cast-iron hibachi grill can be a perfect solution for your needs. These barbeque grills use charcoal, and they're small—some models take up about the same amount of space as a large toaster. You can set a hibachi grill on your balcony, pour in a little charcoal, and you're ready to grill! These grills are also popular with campers and hunters, precisely because their small size permits them to be set up just about anywhere. 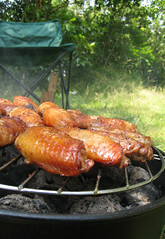 Lodge, BBQ Guys, and Cajun Cookware are just three of the manufacturers of these popular and versatile grills. While a hibachi grill won't allow you to cook for a whole family reunion, it can give you the great charcoal taste of barbeque grilling, even if you don't have much room for a setup. Once you move up into the more traditional-sized portable charcoal barbeque grills, there is still lots of variety in pricing and features to choose from. The classic Weber round charcoal barbeque grill costs around $100, and is one of the best all-purpose grills around. Its round design focuses the heat, and the vented construction with close-fitting lid even allows you to use it as a smoker, on a limited basis. The Portable Kitchen cooker has the classic look of the charcoal barbeque grills popular in the 50s and early 60s, and its durable cast aluminum construction means it will give years of great outdoor cooking performance. For the serious griller, Brinkmann's cast-iron barbeque grill with side-mounted firebox gives you the flexibility to do everything from direct grilling to slow smoking, all with the same equipment. It's a pretty heavy unit, so even though it's mounted on wheels and is technically "portable," this grill requires some teamwork to load and unload.